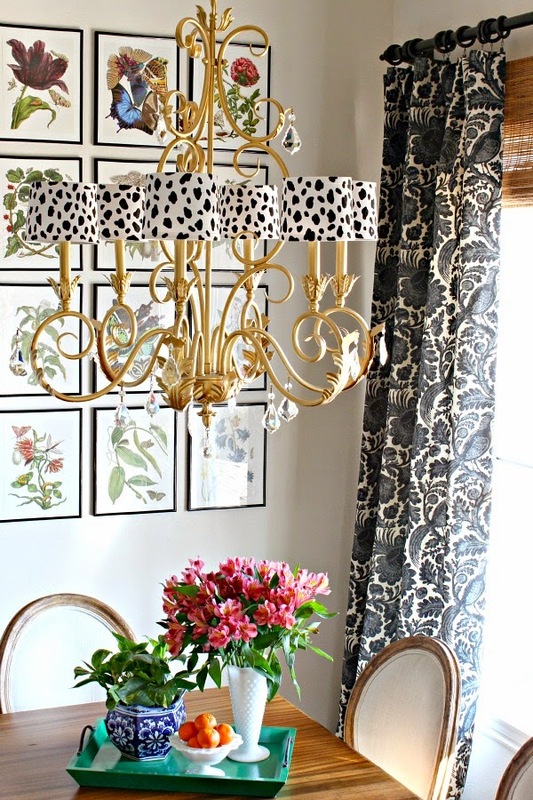 Last week when I showed you a new living room tour, I quickly mentioned that I had painted the chandelier in my breakfast room gold, to coordinate with the new lotus pendant lights in the kitchen. And, I said that I wasn't quite sure I was sold on the color. It just didn't seem to stand out enough. Well, this week I think I solved that little dilemma! Let me start off by saying that I totally and unashamedly copied this project from Dixie Delights. 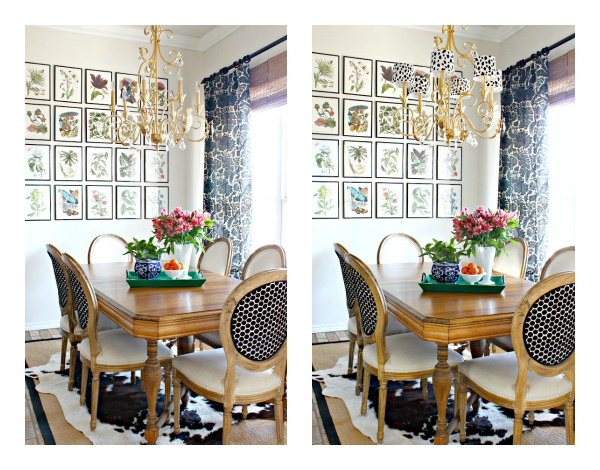 I saw her super fun DIY knockoff of some pricey Ballard shades a few weeks ago, and after some time realized that shades might be exactly the extra touch that my chandy needed. I'll let you head over to Dixie Delights to see the tutorial and supplies you'll need, I'm just showing off my new shades today. To start off with, here's the fixture with and without the shades. I think they add just enough weight and visual interest to make the light stand out a little more. 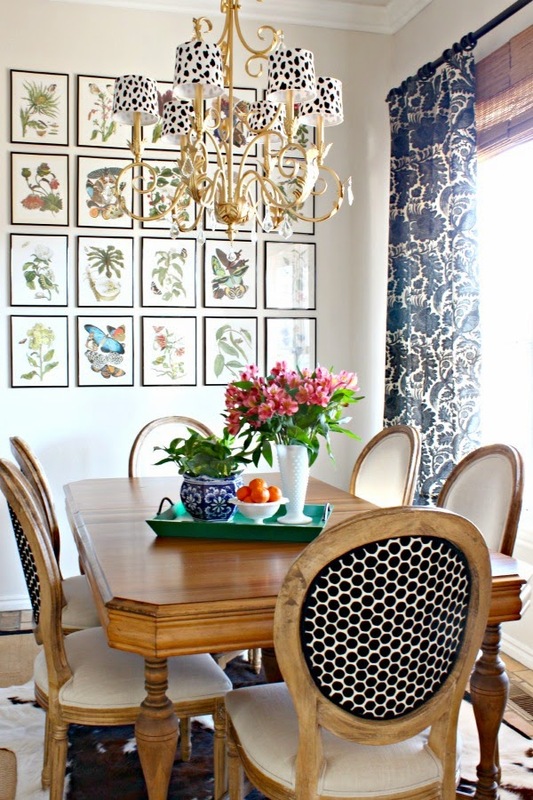 I like the modern spots paired with the more traditional curtain pattern and botanical prints, and, even though they are spotted like the chair backs, I think they still work together. I hope this project gets your wheels spinning! This pattern is so popular right now, and you know I think black and white is a neutral. 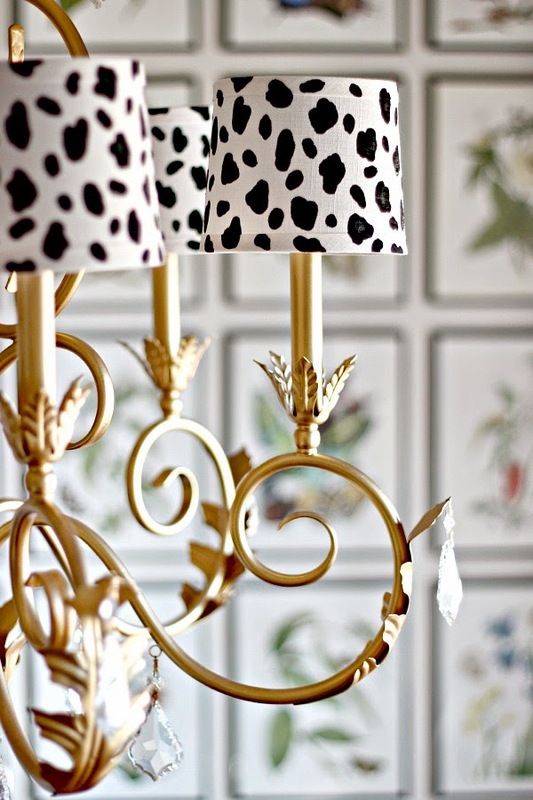 ;) I could see bigger lampshades, pillows, table runners, frames... just about anything decked out in this cute pattern. You can find Amanda's tutorial here. What a huge difference that makes! It looks SO good! Great DIY! I love it Jennifer! It definitely helps balance out your space and is so "you"! these are so fun and SO you! So you, so pretty and so fun! They look so fun! Just like the Ballard Designs version! I adore the shades. They definitely make the chandy. Gold/black/white - what could be better. Such a great idea. Thank you Christina. Yes, I was pleasantly surprised with the similarity! Swoon!!! I think these add the PERFECT touch to your space! Wonderful job, Jennifer! Jennifer, your shades are awesome! 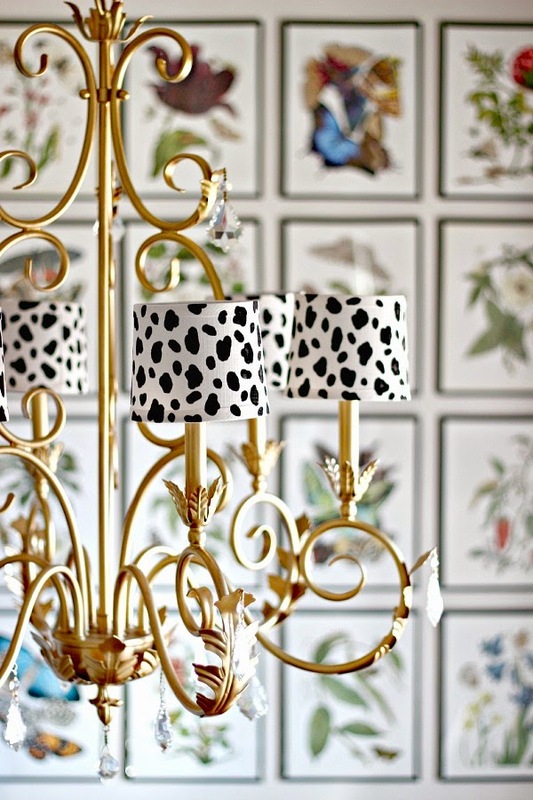 They really enhance your chandelier beautifully! You are so talented! Love them! Perfect for that spot. Thank you Shenita, you're too kind! Great to hear from you, hope you're doing well! The shades are so you Jennifer - pretty and fun! Love, love, love them! So fun! Jennifer, these are just too adorable!! Jennifer, these shades just make your botanical prints pop. Great addition. They are so fun, love them! OMG,I have to make these. Going shopping for fabric now!